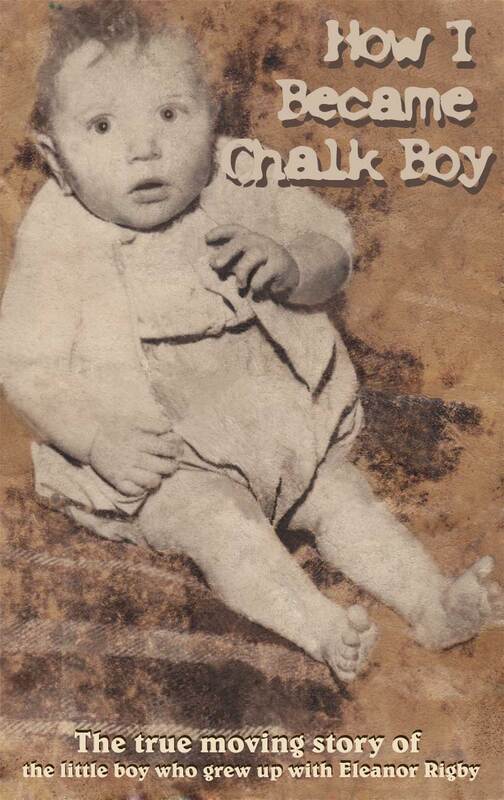 How I became Chalk Boy! Writing a book (autobiography) is very much like trying to pitchfork smoke in the wind……how exactly do you paint the pictures of somebody’s life? Half remembered facts merge into dreams and perceptions that can only serve to distort the image/painting and you end up with a fairground mirror image of what was…. Part truth, part chimera, neither animal nor beast but some kind of mythical creation straight from the Fiction Creation Department of suburban dreams-ville! The story I’m about to tell you is a real adventure; my adventure as I remember it, as I’ve been told and embellished by my own human condition. It’s as truthful as I can make it based upon my own opinions, thoughts and perceptions….. This is my own distorted mirror, my own reality…. It comes from within. It’s taken me over 52 year to write and I suppose I’ll still be writing it on my deathbed….. That’s the thing about life, in a way we are all writers, we all have stories to tell but the reality is different, it’s a bit like going to a wedding and forgetting to take your camera….. If the pictures are all in your head nobody can share that experience and then the memory is lost forever…. Making the effort to write stuff down is still and always will be the best way to record our lives and experiences. I’ve always, since a very young age been aware of my own mortality, the transient and fragile nature of life. My aim in writing this is not to gain any kind of futile aspiration towards immortality but rather to understand why I have become the person I am….. It’s my own personal journey into the abyss. Into the darkness of my own soul in a futile hope for enlightenment. A book written, physical can change the dark matter, becoming a light…..a candle illuminating the past and a magic lantern for the future; A place to create shadow puppets on the walls as the dancing flames flicker back and forth, ephemeral creations in the mind’s eye. These days I seem to spend more time thinking about writing than actually writing, it seems that the older you get the more easily distracted you become, gone are the laser sharp days of youth when the mind seemed more focused, simpler I suppose. Back then we spent all our time running from the past and into the future….it was straightforward, don’t look back, head up and burn up as much distance as you could from your childhood. I’ve always agreed with Jean-Paul Sartre “I hate my childhood and all that remains of it.” I have spent my entire life as a long distance runner, burning up the track and trying to escape the Chimera. But I know completely well, that the beast with two backs….born in a pigeon loft, will follow me to my grave, how could I ever hope to escape or even think of such a thing? The naivety of youth has given way to the maturity of middle age and I now find the courage to turn around and look the beast square in the eye. I’ve always counted myself as lucky by the virtue that I can remember the very moment of my birth. Apparently very few people can do so and some scientists even believe that such a thing is ‘impossible’ due to ‘a baby’s lack of cognitive development’ or words to that effect. Scientists and very clever people believe that children who remember being born must have ‘dreamt it’ The child has obviously had a dream about his or her own birth at a very early age and for some reason this dream has then manifested itself into ‘becoming real’ in the mind of the child. Therein after the child will always perceive or come to believe that they remember their own birth. Science tells us that babies don’t have the capacity to ‘remember’ such a thing. 23 Apr	This entry was published on April 23, 2011 at 12:55 am. It’s filed under books, family, History, liverpool, writing and tagged 2010, artist, autobiography, battle, boy, chalk, eleanor, how.i.became, introduction, philip, rigby. Bookmark the permalink. Follow any comments here with the RSS feed for this post. Newer: What a load of utter Pollocks!